Indian officials investigating several missing persons reports from a nearby city. What they found was a “Tower of Silence,” or dakhma. Zoroastrians use these sites to dispose of bodies in the open air! None of the bodies depicted in the photograph were identified. Villagers from nearby, though initially surprised at the sheer number of corpses in the dakhma, proved unable to recognize the bodies. The corpses also do not match the descriptions of the missing people. There were no animals around except for maggots and flies. Zoroastrians rely on birds (i.e. buzzards) to dispose of the bodies, in the belief they are contributing back to the Earth. Officials found the corpses relatively untouched by any sort of animal. The deep pit in the center of the photograph was filled with several feet of festering blood – far more than the bodies on the outside could ever supply. The stench was so unbearable that many of the officials began to get nauseous when they first approached the dakhma. The expedition was ended when a villager accidentally kicked a small bone into the pit, penetrating the coagulated surface of the pool. A massive burst of gas from the decomposing blood erupted from the pit, splashing those looking into it, along with the photographer. Those caught in the explosion were immediately sent to the hospital, where they were quarantined for possible infection. They became delirious with fever, shouting about “being tainted with the blood of Ahriman” (the personification of evil in Zoroastrianism), despite never having admitted having any familiarity with the religion. In fact, many of them had no idea what the dakhma was when they had found it. Delirium turned to insanity as many began to attack hospital staff until they were sedated. The fever eventually killed all of them. When officials returned with HAZMAT gear the following day, the site was empty. All the bodies had been removed and, astonishingly, the pool of blood in the pit had been drained. All that remained of the incident was this photograph. What is a 'Tower of Silence', Dakhma? The Dakhma is belief to be a circular raised structure used by Zoroastrians for exposure of the dead. The common Dakhma originally denoted any place of the dead. 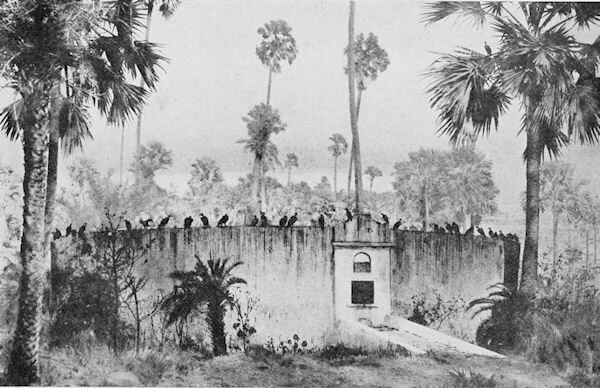 The term "Tower of Silence" is a neologism attributed to Robert Murphy, who, in 1832, was a translator of the British colonial government in India. Zoroastrian tradition considers a dead body, in addition to cut hair and nail-parings, to be unclean. Specifically, the corpse demon was believed to rush into the body and contaminate everything it came into contact with, hence the Vendidad (an ecclesiastical code "given against the demons") has rules for disposing of the dead as "safely" as possible. To preclude the pollution of earth or fire, the bodies of the dead are placed atop a tower and so exposed to the sun and to birds of prey. Thus, "putrefaction with all its concomitant evils... is most effectually prevented." The towers, which are fairly uniform in their construction, have an almost flat roof, with the perimeter being slightly higher than the center. The bodies of men are arranged around the outer ring, women in the second circle, and children in the innermost ring. 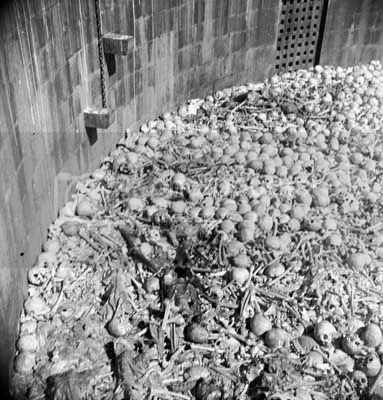 Once the bones have been bleached by the sun and wind, which can take as long as a year, they are collected in an ossuary pit at the center of the tower, where they gradually disintegrate and the remaining material, with run-off rainwater, runs through multiple coal and sand filters before being eventually washed out to sea. The ritual precinct may be entered only by a special class of pallbearers, called nasellars, a contraction of nasa.salar, caretaker of potential pollutants. The earliest reference to ritual exposure comes from Herodotus, where the historiographer describes the rites to have been secret, and "vaguely" that these first occurred after the body had been dragged around by a dog or bird. Further, the Magi (a term that eventually came to signify a Zoroastrian priest but may not have meant that in Herodotus' time) practiced this quite openly, before they finally embalmed the corpse with wax and laid it in a trench. While the discovery of ossuaries (in both eastern and western Iran) dating to 5th and 4th centuries BCE indicates that bones were isolated, that this separation occurred through ritual exposure cannot be assumed: burial mounds, where the bodies were wrapped in wax, have also been discovered. The tombs of the Achaemenid emperors at Naqsh-e Rustam and Pasargadae likewise suggest non-exposure, at least until the bones could be collected. According to legend (incorporated by Ferdowsi into his Shahnameh), Zoroaster is himself interred in a tomb at Balkh (in present-day Afghanistan). While general exposure of the dead is attested from earliest accounts, the ritual customs surrounding that practice appear to first date to the Sassanid era (3rd -7th century CE). They are known in detail from the supplement to the Sayest ne Sayest, the two Rivayat collections, and the two Saddars. The use of towers is first attested in the 16th century. I am not so familiar with the Indian/ Iranian culture and beliefs. But this is the first time I saw something like this. It must be horrible to discover a place like this, but if this is what the Zoroastrians beliefs, so be it. I do not know if they still perform this way of funeral. But they did it some years ago. I wonder if it is legal? Such a place must be a health hazard! But what about the story? Did it really happened? The entire story is based on that first picture. And with a little investigation, it was easy to see the pit was photoshopt! And later on, I found the original picture. The picture was the hard evidence of this story. But the picture is fake, just like the story. Still the picture is amazing! The real deal about the Tower of Silence is really disturbing. Zoroastrians and Parsis in some areas of the world (including India) do still dispose of their dead using dakhmas. But yeah, the story appears to be made up. It doesn't show up in any news sources, only on blogs and tumblrs. This is original an Iranian religion. The focus of the article is on India because of the story. I found a news article about this. They story is fake, the picture is real. 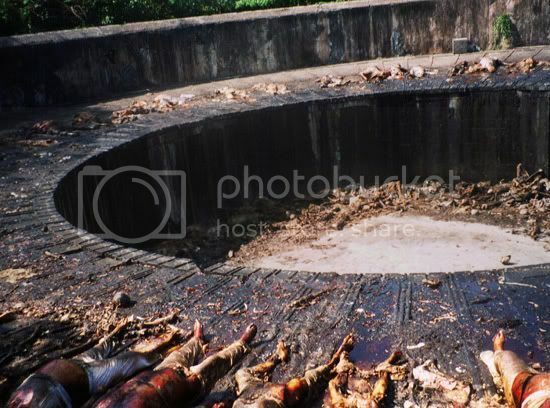 The tower of silence is in Malabar Hills in Mumbai. One cannot go there but there are many high rises around and from some you can quite easily see (with binoculars ofcourse) not just the place but even the bodies. And yes that is a normal way for Parsis (Zorastrians) to dispose their bodies and it still exists till today. Btw, the parsis also have fire temples and some fire temples - the really top ones in the hierarchy need to have a actual dead body as one of the ingredients to keep the fire burning. I am from Mumbai. Please re check your source. I have never heard of fire temples having a dead body as one of the ingredient to keep the fire burning. Whaaaaaaaaat? I wanna go see this place. From reading about it, I suppose i wouldn't be about to just walk up to the dakhma. Even seeing it from a high rise would be pretty breath taking. "I'm from MumbaI", he says like he's automatically an expert. You're a Google expert at best! The picture is real. It shows a tower of silence. It is ont a mystery. When people died they are laid in the tower of silence for the vultures ot eat them. The photo indicates many peple has died during that month (well, in Mumbai there are many Parsis/Zorastians) so it would be normal for many people to die in one month. Since there are less vultures now a days in Mumbai, the bodies take time to decompose. Hence oner one month or so, you can see bodies being piled up. This is what the cpiture shows. The story is fake though. BTw, Zorastians or Parsis are of Iranian origin. Many came to India more than 1000 years ago and settled in gujarat and Mumbai region. their religion is totally different to Hinduism, Islam practiced by most Indians. However they are legally allowed to build tower of silence in the ouskirt of Mumbai. India has been HUGELY influenced by both Persian culture , and later moghol one ! This zoroastrian thing is totally iranian ! I am a Zoroastrian and confirm the existence of Towers of Silence in Mumbai and the practice of disposing dead bodies at this well exists. This religion was ancient Royal religion of Persia. because of Muslim invasion they scattered here and there and most of them are in India now, and the story of the tower of silence is absolutely true. Definitely photoshopped. Parsi bodies are draped only in white clothes when they are laid inside the dakhma. It is impossible that such style and clothing as seen in the photographs will be found in a dakhma. Welcome to The Horror Tree! This website is all about paranormal stories, urban legends and other bizarre and scary stuff. And what is the truth about them! This website contains extreme content matter which most will find disturbing. Viewer discretion is required and advised. For more information about this website read "About"
The Horror Tree. Awesome Inc. theme. Powered by Blogger.